"Mom, please! I'm begging you! Request me into that room." I'm the mother of two school age boys. Near the end of school last year, my second grade son Jon said, "Mom, please! I'm begging you! Don't forget to request me into that Learnball room 'cause everyone is gonna want to get into that room. Everyone says it's nice in there." Of course, I forwarded his plea to the principal. Several times during the summer, Jon asked permission to ride his bike to the school so that he could check the room assignments that were posted each year on the door. One day he came rushing back breathless and beaming. "Yes! I got it!" Over the next couple of weeks—while I heard other children voicing their dread over the prospect of beginning school—Jon looked forward to it. He happily counted off days on the calendar. Over the years, I have worked as a parent volunteer in my children's classrooms. Very rarely did I see the enthusiasm and joy in them that I saw every day in Jon's Learnball class! And, that made my year in third grade as great for me as it was for my son. The children's comments touched my heart. "This year is the best!" "I'm so glad that I got in this room!" Now I do whatever I can, wherever I can to tell parents and teachers what a truly joyful place is a Learnball classroom. 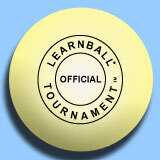 At the beginning of this school year when I heard the term "Learnball," it meant nothing to me. Now, however, this term has come to mean only positive things with regards to learning. This is a fantastic system that gives these children a well rounded education that goes far beyond the academics. Many of the things Jason has learned this year are lessons not found in a textbook. Jason has always been a conscientious student, but this year Learnball has influenced other aspects of his life. I believe it has promoted good behavior, a real sense of responsibility, neatness in his work, pride in his accomplishments, learning to work well with others as a team and most importantly, consideration for other people and their feelings. Not only has Jason been positively affected by this system, but for the first time, he finds school fun, interesting, and he enjoys learning. This positive attitude towards school is crucial. When he came home in September after the first three days of school and said he didn’t want the weekend to come because there was no school, I knew he was at the start of a terrific school year. Now, he doesn’t want the school year to end.What more could administrators, teachers, and parents ask for than a classroom where children are well behaved, where they enjoy learning, and where they consider school fun, not boring. That to me is the ultimate goal in education.